For those attending Comic-Con tomorrow, you'll get to see the Sherlock panel from 3:45 PM to 4:45 PM in Room 6A at the San Diego Convention Center. For those who won't be on hand for the presentation, The Consulting Detectives have released a new photo from Sherlock's highly-anticipated Christmas Special, which doesn't have an exact premiere date at this time. 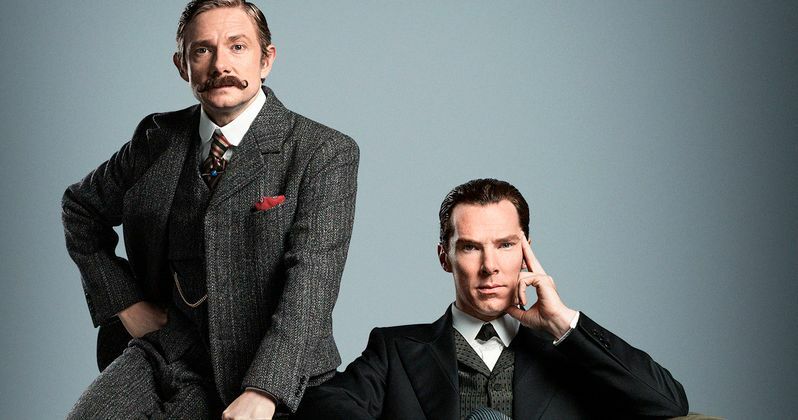 The image features both Benedict Cumberbatch and Martin Freeman as Sherlock Holmes and Watson, but, unfortunately, it doesn't give us any clues regarding this special's story. We've previously seen Benedict Cumberbatch and Martin Freeman in photos from the set while the Christmas Special was still in production, but we haven't seen much since then. The episode will be set in 19th Century Victorian London, with series co-creator Steven Moffat revealing in February that the special is "a separate entity on its own," meaning it won't exactly connect to Sherlock Season 4, set to debut in 2016. This setting is the same time period when Arthur Conan Doyle's original stories were set, but it's still unclear how Holmes and Watson managed to travel back in time. Benedict Cumberbatch and Martin Freeman won't be on hand for the Comic-Con panel tomorrow, but executive producers Steven Moffat and Sue Vertue will be there, alongside actor Rupert Graves, who plays DI Greg Lestrade. It isn't known if the producers plan on discussing the rumored crossover episode with Doctor Who, but we'll find out for sure tomorrow. In the meantime, check out the new photo from Sherlock.